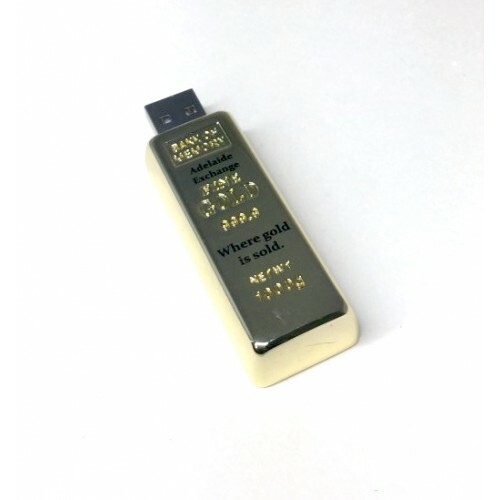 Our Gold Bar USB flash memory units have been supersized for an even more authentic gold bar look. Add some bling and serious weight to your campaign with these units that are 25% larger than our originals. 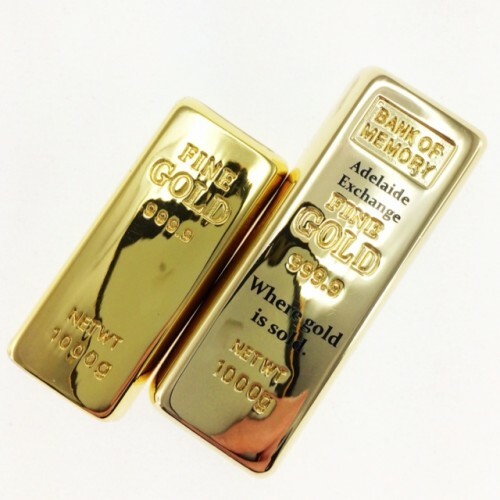 The XL Gold Bar USBs are 6cms long and 2.2cms wide, making them large enough to make a statement while still being compact enough to fit snugly into your pockets. 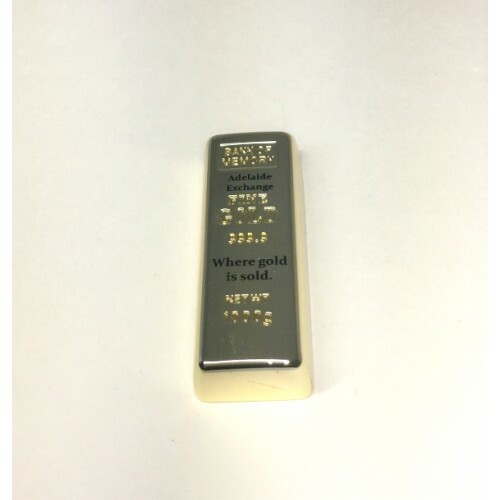 Weighing it at around 70 grams, our XL Gold Bar USBs make great promotional gifts especially once we've customised them with your logo. You and your recipients will definitely love the unique look of this product. The gold bar flash memory drive is activated via a push button at the back which will extend and retract the USB nib for insertion. This product is available in your choice of capacity to match your budget and your event. Choose from 1gb | 2gb | 4gb | 8gb | 16gb | 32gb | 64gb. The minimum order starts from 50 pieces for each memory capacity. We deliver with a standard 2 week turnaround time right around Australia. If you have left things a bit late please do not worry. Normally we can deliver them quicker for a small fee. Simply ask us when you make your enquiry with us. Please call us or follow the prompts on this webpage and we will reply to your query within the hour during work days. We will also load your branded flash drive with data of up to 150MB for free. For Larger data loading volumes, we simply charge a flat rate fee of $0.50 for each additional gigabyte. Every branded flash drive comes in individual polybags. Generally Our trumaround time for promtional USB is 2 weeks upon art approval. Faster shipping for promotional USB drives available, please , see our 3day fast USB category. Price are excluding GST. Free freight with your USB flash drive order. Delivery to all stales in Australia including NSW VIC QLD ACT SA WA NT.